Thank you (Organizers from the DOH Health Policy Development and Planning Bureau) for the invitation and the honor and privilege to be a participant in the DOH’s 7th National Staff Meeting. We were given this title, “Corporate Management of Health Facilities” by the Organizers to develop into a paper for a one-hour allotted talk. Using the information given to us by the Organizers as a guide, to facilitate our giving and sharing of information and practices of Manila Doctors Hospital (MDH) in terms of management of physical facilities that may be useful and applicable in government hospitals, we decided to conceptualize the “MDH Health Facilities Enhancement Program.” Honestly, there is no program that formally carries the name of Health Facilities Enhancement Program in MDH at the time that we received the invitation on June 14, 2013. 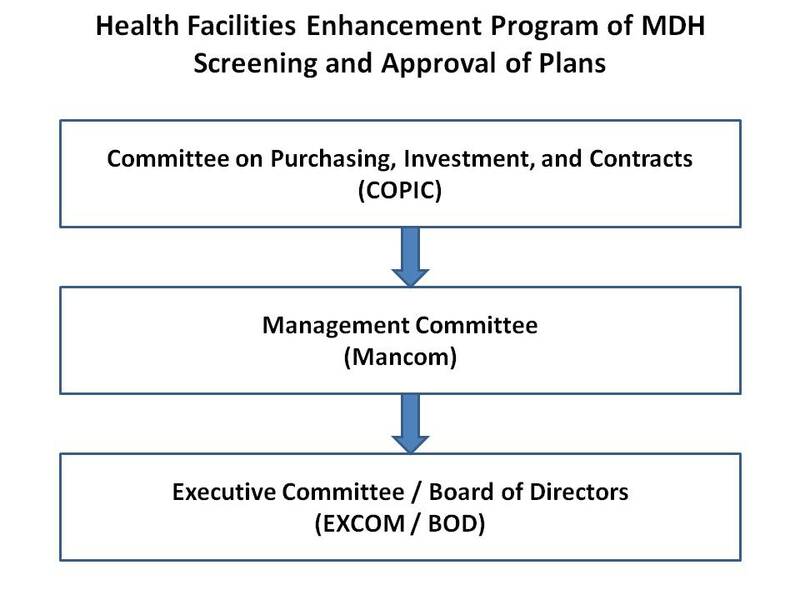 MDH has a Revenue Enhancement Program, but it doesn’t have a so-called or so-named Health Facilities Enhancement Program. For sure, there are myriads of programs, projects, and activities present in MDH that if gathered together, synthesized and integrated, will rightfully constitute a Health Facilities Enhancement Program for the hospital. This is exactly what we did to prepare for our talk today, mentally gather all the existing programs, projects, and activities of MDH that are relevant to facilities enhancement; look at their rationale, strategic and operational objectives, policies and procedures, and practices; then synthesize and integrate all of them into what we think constitute the “MDH Health Facilities Enhancement Program.” Thereafter, we develop a paper entitled “Practices in the Health Facilities Enhancement Program of MDH” to facilitate our giving and sharing of information and practices of MDH in terms of management of physical facilities. We hope that with such a paper that contains the same program name as that of DOH (Health Facilities Management Program), you will be more at ease in listening to our presentation of a program that has essentially similar goals as yours but in a private hospital setting. From our presentation, we hope you will easily be able to discern similarities and differences and pick up what you think are practices in MDH that may be applicable and useful to your government setting. “Health Facilities” in “Health Facilities Enhancement Program of MDH” is operationally defined as the infrastructure and equipment worth P250,000.00 or greater. “Enhancement” is operationally defined as addition and renovation which include deletion or refinement. 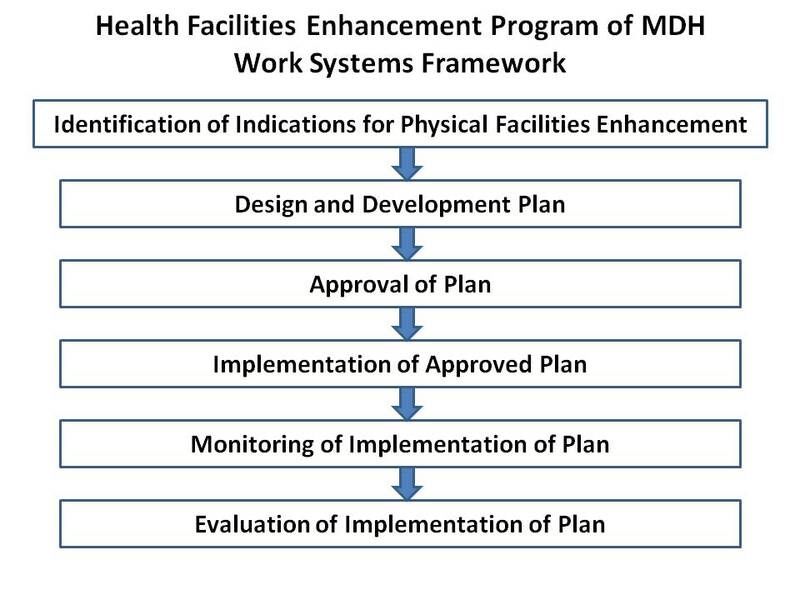 Below is a framework of the work systems of MDH Health Facilities Enhancement Program. Bottomline indication for facilities enhancement is continual improvement towards viability and sustainability of the hospital. Leading center of excellence and wellness in the Philippines providing holistic quality and safe patient care. We are a health institution providing holistic care that exceeds industry standards and that anticipates and responds to the needs of the patients, their families and relevant communities. Driven by our determination to make healthcare accessible to the marginalized and the underserved, we consider it our ardent commitment to provide service that is guided by ethical standards and improve the healthcare delivery system with pronounced social impact. These establish ManilaDoctorsHospital as a vital partner of the Department of Health, local government units and other likeminded institutions in empowering the communities and the public we serve to sustain health and wellness. We are engaged in heightening the consciousness and the participation of the public in targeted health and environmental issues in the global community. To operate a world class hospital. To undertake training and research programs to continually improve quality and safe services. To pursue corporate social responsibility programs. MDH has four key programs that are closely associated with physical facilities enhancement management. These are the Clean Hospital Program; Comfortable Hospital Program; Safe Hospital Program; and Green Hospital Program. Although each program is managed separately with clear goal and objectives and with a distinct coordinating and supervising body, there are overlaps and interfacings among the four programs in which mechanisms for alignment and integration are in place. The following table shows the coordinating and supervising bodies and goals of the different programs and examples of facilities usually needed to be put into place and continually enhanced. MDH operationally defines its customers or clients to consist of patients, health-maintenance-organizations and companies, and its accredited physicians. It listens to its current and potential customers through a customer need inquiry system and customer feedback system. “Customer need inquiry system” refers to the communication system to obtain information on the service needs (inclusive of the facilities and amenities needs) of the customers before they go to the hospital. This is usually applicable to potential customers of MDH and these include those who have used the services of other hospitals. The communication tools used may be face-to-face and/or non-face-to-face (print or digital media) interaction. “Customer feedback system” refers to the communication system to get information, particularly reactions, comments, and suggestions, from the customers on the quality of services rendered and also of the facilities and amenities, both during or intra-service and after or post-service. This is done to current customers of MDH. Information on needs of customers may also be obtained from the feedbacks received. The communication tools used may be face-to-face and/or non-face-to-face (print or digital media) interaction. As mentioned, during the review of vision, mission and strategic objectives; statutory and regulatory requirements; clean, comfortable, safe and green hospital programs; and voice of customers, we invariably identify areas of improvement for which we make resolutions and plans, inclusive of facilities enhancement. Aside from these four traditional areas as sources for indications of physical facilities enhancement, proposals can also come from the department heads, committee chairs, and any internal staff for that matter but channeled to their respective department and committee heads. The Committee on Purchasing, Investment, and Contracts (COPIC), the Management Committee (Mancom), the Executive Committee (EXCOM), and the Board of Directors (BOD) are the usual screening, approving and authorizing bodies for all design and development plans, especially those plans that carry a budget of Php 250,000 or greater. The membership of the COPIC consists of the Hospital Director, Medical Director, Administrative Director, Finance Director, Head of Material Management Department, and a member of the BOD (as Chair). The membership of the Mancom, which is created by the BOD, consists of the President, SVP for Corporate Affairs, SVP for Medical Affairs, another member of the BOD, Hospital Director, Medical Director, Administrative Director, and Finance Director with the President as the Chair. The membership of the EXCOM, which is created by the BOD, consists of the Chairman of the BOD, vice-Chair of BOD, Treasurer, President, SVP for Corporate Affairs, SVP for Medical Affairs, Hospital Director, Medical Director, and Administrative Director with the Chairman of the BOD as Chair. Risk assessment, transparency, ethical practices and fiscal accountability are observed early on at the level of COPIC. Oversight is done by the Mancom then EXCOM prior to getting the imprimatur of the BOD. After the proposals and design and development plans for facilities enhancement are approved, they are executed with resultant purchase of equipment and construction / renovation of infrastructure. Upon arrival of the purchased equipments or products, these are inspected for compliance with specifications and functionality by the concerned departments of the hospital such as Biomedical Unit and end-users for equipments. For the finished infrastructure products, the Facilities Management Department does the inspection. Depending on agreement with the suppliers and contractors with the hospital, the payment scheme can be on down-payment or full-payment basis. Depending on the circumstances too, particularly for high-cost facilities, MDH can opt to practice a retention payment scheme to ensure quality purchased equipment and after-sale services. It usually requires from contractors guarantee or performance bonds equivalent to 10% of the total costs for infrastructure projects. Monitoring of the approved plan is not limited to the functionality of the purchased equipments and constructed / renovated infrastructure but include all the key measures and indicators of performance, outcome, and impact contained in the approved design and development plan. Examples of usual key measures are return of investment; contribution to vision and mission and goals of strategic objectives; contribution to clean, comfortable, safe and green hospital programs; customer engagement; efficiency and productivity; workforce engagement; fulfillment of societal responsibility and support of community; and, last but not the least, the bottom-line target, impact on viability and sustainability of the hospital. Focusing on the equipment, monitoring primarily includes functionality, life span, and return on investment. Proper usage and preventive maintenance are key measures to promote continuing functionality to reach and even surpass the expected life span of the equipment. Effective business development programs are strategies to promote maximal utilization of the equipment so as to achieve the target on return on investment. [Example] The workforce in charge of monitoring and measuring the performance of the equipment are the requesting department, Biomedical Unit, Business Development Division, and Finance Department. The same policy used in the monitoring of implementation of plan applies in evaluation. Evaluation is not limited to the functionality of the purchased equipments and constructed / renovated infrastructure but include all the key measures and indicators of performance, outcome, and impact contained in the approved design and development plan. Various scorecards and checklists are being used. There are scorecards and checklists that are specific for equipment and for infrastructure. There are also scorecards and checklists that are more encompassing, which go beyond the functionality of the equipment and infrastructure, meaning they look at the entire design and development plans in which physical facilities are enhanced just to afford convenience for service or health programs to be implemented. The evaluation of the implementation of plans is done by both internal auditors (self-assessors, internal quality auditors, and an internal auditor reporting to the BOD) and external auditor, namely, SGV & Co.
All health facilities enhancement program must have a structured and comprehensive work systems. It should start with identification of indications for enhancement. Then, design and development plan of identified need for enhancement. Then, approval of proposals. Then implementation of approved plan; monitoring and evaluation of implementation. There should be clear-cut policies and procedures. Risk assessment, transparency, ethical practices and fiscal accountability should be considered and observed throughout the entire work systems. There should always be measurement, analysis, and evaluation of outcomes of the program. The bottom-line goal of facilities enhancement program is continual improvement towards viability and sustainability of the hospital with achievement of it’s vision and mission. This entry was posted in Health Facilities. Bookmark the permalink.